Legendary. Once the hottest pepper in the world at over 1 million Scoville units (habaneros are 100K!). Subsequently dethroned by Trinidad Scorpion and Carolina Reaper. Smokey flavor, slow to grow but eventually makes tall plants and many fruits. 2-3” thinwalled, wrinkled, red fruits. 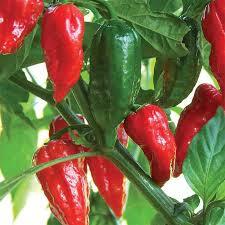 Needs warm soil such as: black ground cover around plant or grow in a black plastic pot or in a hoophouse). 100-120 days. Open-pollinated.